In this week’s edition of Tutorial Tuesday, graphic designer Niño Batitis gives us his step-by-step progress of his image manipulation techniques. Create a New document in Photoshop. The size used for this tutorial is 8 in by 11 in. Apply a pale-yellow radial gradient in a new layer. In the image, place your subject – which in our case – is the image of a gladiator. Because the figure isn’t a simple shape, we clean up the image by using the Pen Tool (P) and creating paths. 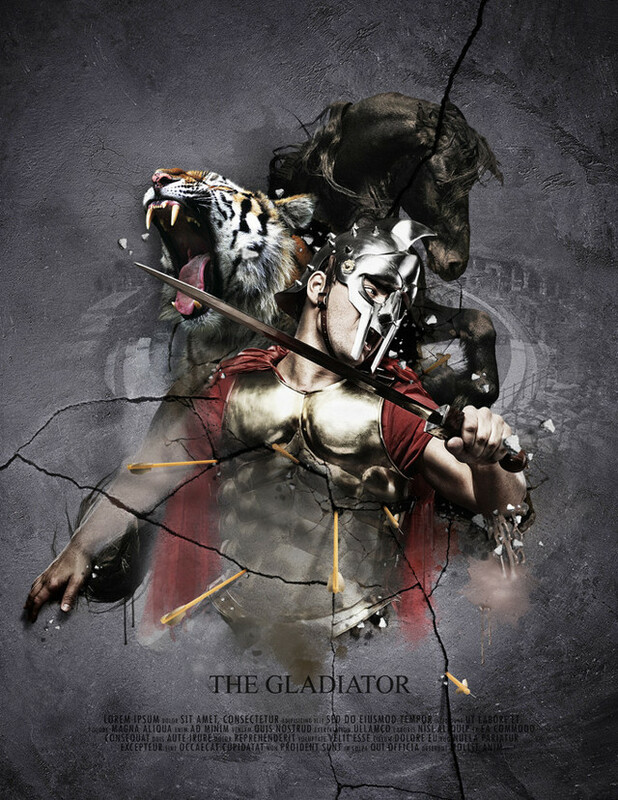 Add an image of a tiger behind the gladiator, re-size and clean it up using the same masking process. Apply a texture of a cracked wall into the image! This bring out a lot of character in your work and fills up all the space nicely. Erase portions of the wall so that it blends with the over all image. You can also create additional cracks by drawing them using the brush tool (B). Add more cracks and accents to the images to create more depth. A picture of a horse was added to the background. He also used adjustment layers such as Hue and Saturation, as well as Color Balance – to shape the mood of the image. Behind the horse, a photograph of a Roman stadium was added and blended into the image at a very low opacity. A fake movie title and dummy text were added to the bottom so that it looked more like a trailer. Around the soldier’s arms, stock images of paint were added and blended into the image using a combination of the mask tool, in addition to more details around the arm-area of the gladiator. If you want to read more tutorials like this, you can check out last week’s edition of Tutorial Tuesday. Like it? Love it? We hope this tutorial has helped you in some way! Whether you liked it, loved it or thought you could have done it better – let us know in the comments. If you’ve made anything using this tutorial, let us know in the comments!